Cheek application directions for contouring your face with mineral powder bronzer, highlighter and foundation and add cheek color: Apply your foundation shade that matches skin tone. Apply the mineral powder bronzer to the outer circle of the face. Apply the highlighter to brighten the forehead, chin, and top of cheekbones under the eyes. STEP 1: BRONZING POWDER: Starting back in the hollowed out area under the cheek bone & near the hair line, brush forward your Mineral Bronzing Powder. Let it disappear as it comes about 1/2 way to the center of your face. Remember, you are creating DEPTH with your bronzer. 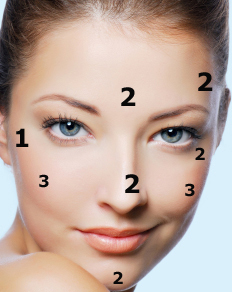 Many more options are available for placement depending on your face shape. STEP 2: HIGHLIGHTING POWDER: Starting in the temple area & on top of the cheek bone, brush forward on top of cheek bone gently. You are adding BRIGHTNESS and creating more contrast to your face. Optional: you can also apply on the chin and along side the nose area, even a tad above each arch of the eye brow. STEP 3: "CHEEK COLOR: Simply smile, and locate the “apple” of the cheek (the round part). Then brush a soft short stroke of cheek color back staying on top of the cheek bone. This gives your face some pretty soft color and brings the look alive.